Sea ice is a thin skin of frozen water covering the polar oceans. It is a highly variable feature of the earth’s surface. Sea ice extent varies with seasons from a minimum area of about 7 million km2 in September to about 14 million km2 in March in the Northern Hemisphere. The variation is much larger in the Southern Hemisphere, from a minimum area of about 4 million km2 in February to about 20 million km2 in September. 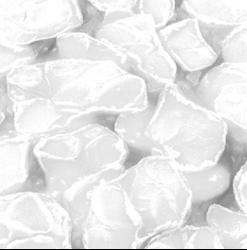 The structure of sea ice is complex and includes many types, such as first-year ice, multiyear ice, frazil ice and grease ice. The Arctic sea ice had an average of approximately 2-3 meters in thickness. The Antarctic sea ice is much thinner with an average thickness of 0.5-1 m. Recently, large reduction in the Arctic ice has been observed with an average thinning about 40% in thickness from the record of 1958-1976 to that of the 1990's (Rothrock et al. 1999, submarine data). The sea ice strongly interacts with both the atmosphere above and the ocean underneath in the high latitudes. In a coupled climate system, changes in sea ice extent, thickness and concentration regionally or globally would influence oceanic and atmospheric conditions, which in turn affect the sea ice distribution. The physical and dynamical processes affecting the weather and climate are considered as follows. The high albedo of the sea ice reflects more solar radiation back to the space. The feedbacks are considered as positive. The broader the sea ice cover, the higher the surface albedo, which result in less amount of solar radiation absorbed at the Earth’s surface. A cooler surface would favor more sea ice to form. The process would be reversed in less sea ice situation. The sea ice restricts the heat/water exchange between the air and ocean. The presence of extensive areas of sea ice would suppress the heat loss in winter and the heat gain in summer by the ocean. Even a thin ice cover influences the turbulent heat transfer significantly between ocean and atmosphere. The surface fluxes of sensible and latent heat can be greater by up to two orders of magnitude at the open water surface of a lead or polynya than that through (snow covered) pack ice. The sea ice modifies air/sea momentum transfer, ocean fresh water balance and ocean circulation. The freezing and melting of the ocean surface and the associated fluxes of salt and heat produce major changes in the density structure of the polar water. Formation of sea ice injects salt into the ocean makes the water heavier and more convectively unstable, conversely when melting occurs, stable and fresh layers can prevent deep convective activity. No sea ice assimilation system is available for now. Instead, an analysis algorithm, which is based on NASA Team Algorithm, has been used to derive sea ice concentration dataset at the 5 minutes latitude-longitude grid from the 85GHz channel of the Special Sensor Microwave Imager (SSM/I). In the Global Forecast System (GFS) the half degrees version of the sea ice concentration product is used. Sea ice and snow thickness are based on model spin-up values or climatology. The sea ice models are categorized in two kinds. 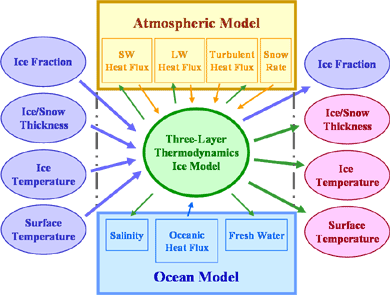 The thermodynamic model treats thermodynamic processes based on the principle of the conservation of energy, which determines ice formation, ice growth, ice/snow melting, ice/snow temperature structure and open water (leads). The dynamic model handles dynamic processes based on the principle of the conservation of momentum, which determine ice motions, ice deformation and open water. Both thermodynamic and dynamic processes contribute to determining the open water area within the ice cover. A three-layer thermodynamic sea ice model has been coupled to NCEP GFS. It predicts sea ice/snow thickness, the surface temperature and ice temperature structure. In each model grid box, the heat and moisture fluxes and albedo are treated separately for the ice and the open water. Two case studies (for January and July 2004) show a satisfactory agreement for the anomaly correlation between the experiments with and without interactive sea ice. With interactive sea ice the low-temperature bias in the lower troposphere in the high latitudes during winter have been greatly reduced (See Figures 1 and 2). Since May 31, 2005 operational GFS include the interactive sea ice. Additional improvement for sea ice in the GFS would be (1) improving the schemes of surface albedo and turbulent heat fluxes and (2) upgrading the ice model to more levels in the vertical. Figure 1 The temperature bias (K) verified against the analysis over 60N-90N at 1000 hPa for January 2004. The black line shows the bias of the GFS with no sea ice model, and the red lines coupled with the sea ice model. It can be seen that the cold bias has been greatly reduced at day 5, from more than –1.4 K when no sea ice model is used to less than –0.5 K when the interactive sea ice is introduced . Figure 2 Same as Figure 1, except for over 60S-75S and for July 2004. It shows the cold bias has been greatly reduced at day 5, from about –3.0 K when no sea ice model is used to less than –1.5 K when interactive sea ice is introduced. Currently, the GFDL Modular Ocean Model version 3 (MOM3) is coupled with the Climate Forecast System (CFS). It excludes the polar ocean. There is no sea ice model coupled to the ocean component. The sea ice is treated in a very simple manner in the atmospheric model - 3 m depth with 100% concentration (i.e. no open water within the ice covered area). The surface temperature is predicted based on energy balance at the ice surface. The ice initial condition is based on the analysis, and thereafter the sea ice climatology is used to update the sea ice change. Sensitivity test using sea ice similar to that in GFS shows reduced low-temperature bias in the polar region. Hunke, E. C. and J. K. Dukowicz, 1997: An elastic-viscous-plastic model for sea ice dynamics. J. Phys. Oceanogr., 27, 1849-1867. Rothrock, D.A., Y. Yu, and G.A. Maykut, 1999: Thinning of the Arctic sea-ice cover. Geophysical Research Letters, 26, 3469-3472.